You can use the Research Log and its Tasks to create to-do lists to help in your research. These tasks can be attached to persons, events (Tags), Sources, and/or Repositories. You can also create a Research Task that is general in nature and is not attached to anything. Each Task can be created with as much detail as the user desires or it can be just the basic information needed to help the user during research. In addition, the Task is a good place to make notes as to what as to what data was found or not found during a research trip. These notes can include what repositories, sources, and records were consulted and the results of the search. The left of the window is a listing of Tasks based on the Focus as indicated in the lower right of the window. Above the Focus information is the information for the Task that is highlighted in the Task listing on the left. To create a Task, you would click on the [Add] button in the lower left of the Research Log window. This displays the Research Task window such as shown below. Depending on the Focus of the Research Log, the Person, Event, Source, or Repository will be shown in the upper part of the window although the Task may be attached to other records by clicking on the [ ] button to access the appropriate Picklist and select the appropriate record. If a General Research Task is desired, any record attachment to a Person, Event, Source, or Repository would be deleted by clicking on the [ ] button for that record. 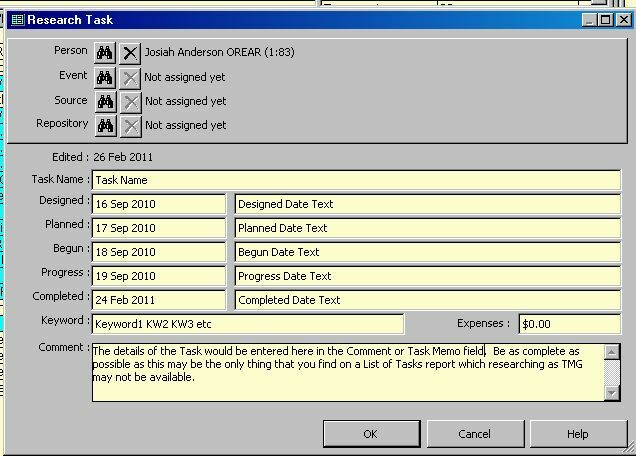 Once the new Task is assigned to the appropriate records, the user would enter a Task Name. This can be short or long as desired. I usually try to make it short although some just need a better description. After a few Tasks have been created, the user can generate a List of Tasks report to see how the Task Name appears on the report. This will give more insight into how a Task should be named. For a new Task, the Designed Date filed will be already entered. As the user gets ready to do research and after research is done, other dates may be entered detailing what has been done regarding this Task. The fields to the right of each date field can be used for text relating to that date. These are optional fields which can be handy to keep short notes. The notes may be used for filtering of Tasks for the Research Log and/or the List of Tasks report or just as another place to record remarks. Below the date fields is the Keyword field. This field can be used to enter anything the user desires. It is a free form field that can be used to filter Tasks for the Research Log or the List of Tasks report. Keywords may be of any length and are separated by a space. It is suggested that Keywords be short to allow as many as needed to be entered. It is also suggested that abbreviations and acronyms be used. Expenses incurred during the research of a Task may be tracked. 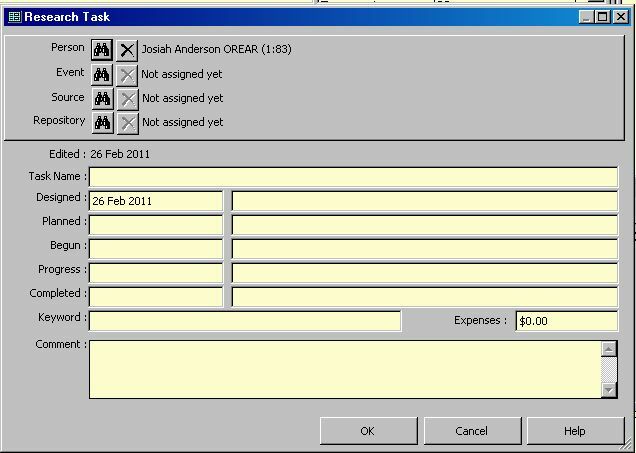 The total costs for a Task may be entered in the Expenses field at the right of the Keyword field. The Comments or Task Memo field would normally be used to enter the details of the Task. It is suggested that the user enter any information that might be needed to help locate the desired source documents and the specific data within those documents. This might include the names of the persons, the date(s) and place(s) the event occurred, the name of the Source, and/or the name of the Repository. This might be somewhat redundant if the data is entered in the Task Name or in the record(s) to which the Task is attached, but may be useful in how the List of Tasks report is generated. Keep in mind that your computer and/or TMG may not be available during research and only the List of Tasks report for this Task is all that you may have available. Thus redundancy here may be the difference between finding the right document and having to leave and go back later. The Comments/Task Memo field is also a good place to enter the results of any research. The user may also enter thoughts about what has been found. Details about costs may also be entered here and totaled for the Expenses field. When a Task is created, the [ ] button in the Toolbar, Tag Entry Screen, Source Definition window, or Repository Entry window changes to [ ] to indicate a Task has been added and it the Task has not been completed. When all Tasks for the Focus person, Event, Source, or Repository have been completed then the [ ] button changes back to [ ]. Note that the current date is entered as the Edited Date. 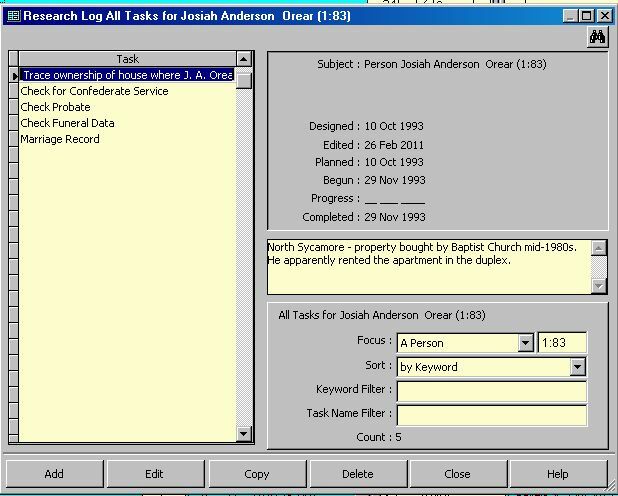 This is not printed anywhere, but is displayed on the Research Log when the Task is highlighted and is shown in the Task itself. Below is a sample Research Task attached to a person. Note the Task has entries for all Dates and Date Text fields. The Task Name, Keywords, and Comment/Task Memo fields also have entries. Task Stages The dates and text for that date. Expenses The total costs for the Task. Memo The contents of the Comment or Task Memo field. Blanks when missing An underline to indicate an empty field. Probably the best use of the List of Tasks report is in preparation for a research trip and as notes to help while on the trip. Thus you would design the report to contain Tasks to be done at the Repository that is being visited, the questions to be asked of the person being interviewed, etc. The report may have General Tasks such as a list of books to be found at a library or book store. A report is generated by Repository or Keyword representing the Repository can be helpful to know which Task should be researched at which Repository. The Task Memo (Comment) can contain all the information needed to research the Task. If the user generates the List of Tasks report to a file, it can be edited to the format the user desires. Often only the Task Memo is needed while on a trip with some rooms for notes. This shortens the report to just the main information needed. Keep this in mind when entering the Task Memo or Comment and this would be why a certain amount of redundancy is useful for this entry. During the editing of the report, the user can rearrange and format it to facilitate the expectations for the places in which research is to be done. Did Josiah Anderson Orear own the duplex house on North Sycamore (property bought by Baptist Church mid-1980s). Check for marriage of Josiah Anderson Orear to Betty Smitha (26 Jan 1875). Check Probate for Josiah Anderson Orear died 15 Sep 1914. Check Funeral Data for Josiah Anderson Orear (d. 15 Sep 1914). Which funeral home was in charge? Death Cert states Sutton & Eastin had funeral -- those records destroyed. Look in Advocate microfilm for obit in issue of 16 Sep 1914. Check for Confederate Service for Josiah Anderson Orear. Was he in Ky 9th Mtd Inf. Co. H or was it some other Josiah? He and others were "drafted" to dig graves for dead soldiers off Reid Avenue. He was born 21 Mar 1844.
may be the only thing that you find on a List of Tasks report which researching as TMG may not be available. Names of persons, etc. and dates would be included. Compare this report example with the one just above this one which is the same Task as the last Task in this report. Only the Task Memo is retained while all other data for a Task is deleted. The Tasks are then arranged by Repository, facility, person to be interviewed, etc. or however the user feels would work best. Each section may given a header to signal the first Task in a section if the user feels the need. Line separators may also be included to delimit Tasks and sections. There are many ways that Tasks may be entered. and many ways to generate and edit the List of Tasks report. The above description is only one of those ways. The user should experiment to see which works best for their needs.